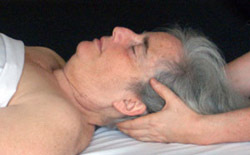 I am often asked what it takes for me to do this work, massage with people with cancer. My answer is nearly always the same: It takes other people’s words. Some people think regular contact with cancer and pain and disease would be especially hard. Some days are more challenging than others, but I think lots of things that humans do are hard, and most are harder than what I do. Short quotes, poetry and prose offer survival tips along the way. Even the briefest quotes can inform my hardest choices and my best plans. Prose and poetry deepen the discussion in my classrooms. I collect other people’s words because they fuel my work with people with cancer. This website is littered with some of my favorite quotes. I offer a few more here, plus a story or two of my own. Have compassion for everyone you meet even if they don’t want it. What seems conceit, bad manners, or cynicism is always a sign of things no ears have heard, no eyes have seen. You do not know what wars are going on down there where the spirit meets the bone. People should worry about each other. Because worry is just love in its worst form. But it’s still love. Sometimes teachers appear when you ask for them. Sometimes they appear anyway. True teachers are often different from what we expect. Messier, strangely packaged or achingly familiar, insistent or just passing through, teachers nevertheless transmit whatever we need and are ready to learn. In my experience teachers run in packs. The phone rang on a glorious autumn morning. A local woman wanted to schedule a massage for a friend of hers who was in the final days of metastatic cancer. Hospice had just been started and her friend was dying at home. I made arrangements with the client’s husband to come over and provide a massage that day. A few hours later, I made my way to their house through a classic, brilliant New England September afternoon. The drying leaves sharpened their orange edges on the blue space above me. I arrived at the house and moved into the soft, quiet interior. A home where someone is actively dying is like a different culture, with its own rhythm and code of behavior. The house has a palpable pulse: slower, deliberate, everything organized around the vigil. Conversations may be hushed or hollow, or may be especially warm or reflective. Pretense is often scrapped for the mean, authentic moment. Meals are skipped. Unopened mail lies in piles. Calls are screened and dishes pile up in the sink. Emotions tumble out in surprise attacks, or they are held close and dear until it’s over. Necks grow stiff from sleeping in odd positions, then snapping to attention. Meaning stands out in sharp relief and can be found anywhere-in the patient’s mumbled words, in the Luna moth hanging from the screen door, in the weather or the movement of the moon across a room. Voices are husky with unshed tears or strained with fatigue. Whenever I enter this world I am acutely conscious of being a stranger to it. I enter with my clipboard, my lotion and a degree of openness. I try to move unobtrusively and wait for the right moment to weave myself in with the larger rhythm. It’s a bit like calculating a jump from a fast-moving vehicle to a slower one in the next lane. That first afternoon, I checked in with a few family members about the client’s status. Then I warmed my massage lotion in the microwave, removing a cold, forgotten dish of food from within, and washed my hands. I climbed the stairs to the client’s room, greeted her softly and began to set up the room for the session. Suddenly two gatekeepers appeared. A huge gray cat flew in out of nowhere. It hurled itself onto my client’s bed and parked between us, an effective barricade. A half-grown silky black dog skittered in and stood firmly in front of me, shadowing my knees as I tried to move about the room. I gently nudged the dog aside and peeled the cat away to insert a pillow under the client’s knee. I draped and bolstered her thinning body and heard her soft sigh of relief as she rested heavily on the pillows. As I began the massage the dog put a paw on my leg, which stopped me. He looked into my eyes, barked once, growled quietly and stared at me for about a minute. His deliberate gaze seemed to say it all. Pay attention. Don’t mess with her. For everyone’s sake, be careful. Seeming satisfied that I had heard, he then dropped the stern guard dog persona and became a puppy again. He lowered his head to my ankles, carefully licking them while I stroked my client’s back. He and the cat kept watch at each visit. I was especially stirred by the dog’s attentions. Only five months old, he had joined the family just a month before, the day her hospital called to release her from an experimental treatment and told her they could do nothing more. He landed in the family in the middle of this news. Once in their home, he sniffed the scene and acted as though he understood immediately what was needed. What was needed was help, real material help to get through what had to be gotten through. What could not be gotten around, but must be met, managed, and survived. He seemed to know they needed not only his love during this time, but also his strong sense of duty and his humble offer of distraction. Barely more than a puppy, he took his responsibilities seriously and rarely left my client’s or her husband’s side for long. Upstairs with my client, I learned that her lower back gave her pain, that in addition to me and the animals, she saw other figures in the room, and that she was terribly parched but unable to drink without vomiting. Her body was drying to a thin film, to be borne away by the season. Her family, friends and animals kept watch and cared for each step of her passage. Around the edges of her sessions I would sit on the porch and chat with her husband. At the first visit, I learned that it was his ten-day wedding anniversary. Partners for more than a decade, they were married in a small garden wedding at her mother’s, when she was still able to stand. My last session with her was on a Thursday night, a point in her journey when regular massage would have been too stimulating. She was barely responsive so I simply held her head, her shoulder, stroked her arms. When someone is trying to leave their body, hold it quietly. Touch should not ask too much of the body, nor pull it too close. It should cradle it instead, letting it rest between efforts. I sat at her head. A friend of hers sat holding her feet dearly, saying goodbye. Curtains fanned us from the open windows. 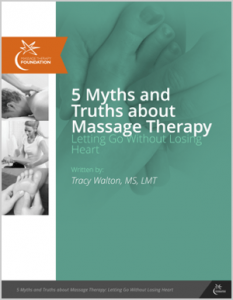 When I left, my client slept in her darkening room, a luminous moon sliding across her feet. She died two mornings later. I learned a great deal from these brief exchanges. There were teachers on every surface – the bed, the porch, the floor at my feet. The animals taught me that love and duty prevail in the toughest situations. My client and her husband taught me that beginnings and endings can be in the same sentence, such as, “They married two weeks before she died,” or even, “the puppy joined the family to help us help her leave.” My client’s husband showed me dignity and a bottomless connection to his wife, to everything that had ever happened and was about to happen to her. Copyright © 2005, Tracy Walton.